MIDDAY MONDAY UPDATE: Michael has become the season's seventh hurricane, and is now expected to become a major hurricane before it makes landfall. The story below has been updated to reflect this change. Tropical Storm Michael will be a significant hurricane threat to portions of Florida’s Gulf Coast by midweek. It could even become a Major Hurricane prior to landfall. A Hurricane Watch has been issued from the Alabama-Florida border to the Suwannee River, and for all inland counties of the panhandle. A Storm Surge Watch is in effect for all coastal areas from Navarre Beach to and including Tampa Bay, and a Tropical Storm Watch extends as far south as Anna Maria Island. Coastal and inland residents in the Hurricane Watch are being urged to complete their hurricane plans Monday as the risk of dangerous surge, rainfall, and wind impacts continues to increase. 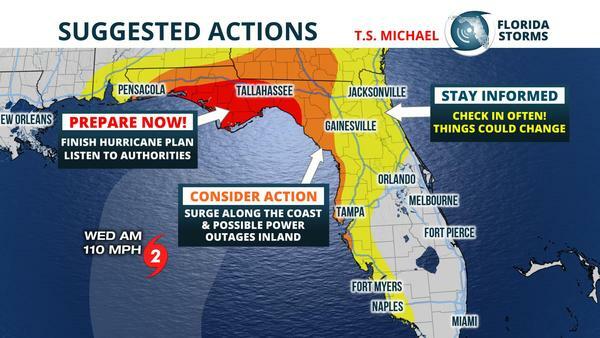 Coastal areas further south, including Tampa Bay, might also experience a significant storm surge and tropical storm conditions from Michael. The season’s twelfth named storm became better organized overnight and was close to hurricane strength Monday morning. As of the 5 am advisory, the National Hurricane Center placed the center of the storm about 90 miles east of Cozumel , and it was moving north at 7 mph. Maximum sustained winds were at 70 mph and the pressure had fallen to 983 mb. Satellite data still suggests the storm is being influenced by westerly wind shear (fast winds aloft from the west), and this has kept most of the deep convection confined to its eastern semicircle over the past 12 hours. Despite the wind shear, Michael has been able to rapidly intensify due to very warm sea surface temperatures and a favorable pattern aloft for deep convection. The intensification trend could continue for several days, and the official forecast is for the storm to reach Category 2 strength by Tuesday night. In his key messages posted with the 5 am advisory, Hurricane Specialist Robbie Berg said “there is even a real possibility” that Michael will become a major Category 3 hurricane before landfall. 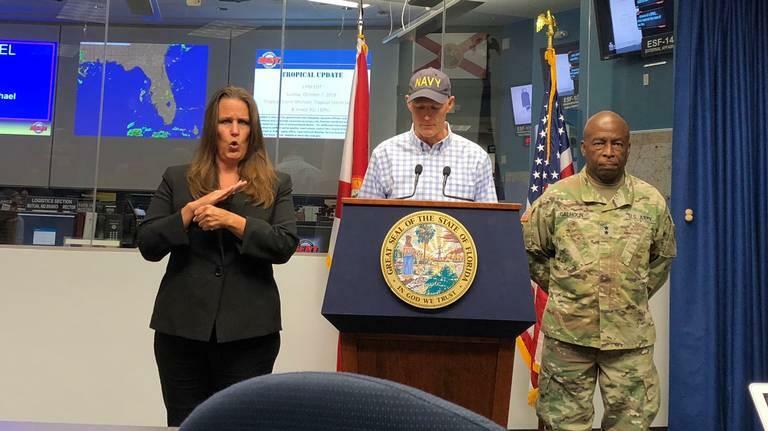 He also expressed rather high confidence in the forecast track of Michael, bringing it ashore somewhere between Destin and Steinhatchee, Florida. 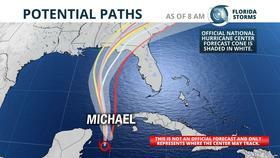 The eventual intensity Michael reaches will largely hinge on how fast the storm moves across the warm Gulf waters. 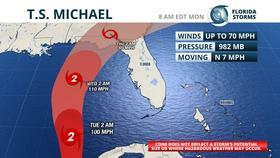 Considerable uncertainty remains on whether Michael will slow down as it approaches the coast. The GFS, for example, brings Michael well inland by Wednesday afternoon. In contrast, the European model is much slower and doesn’t bring Michael inland until midday Thursday. A slower storm would have more time to intensify before interacting with land, whereas a faster storm’s window for further intensification would be reduced. Regardless of Tropical Storm Michael’s eventual track or intensity at landfall, it will likely produce a significant storm surge across a large portion of Florida’s Gulf Coast. Hurricane force winds are also likely to produce significant damage to structures and trees near and east of where the center comes ashore. Inland flooding will also be possible across a large area of Florida’s Panhandle and portions of North Florida, and tornadoes can not be ruled out in some of the stronger outer bands across most areas of the peninsula. Specific impacts at the local level will be shared later Monday as new forecast data is analyzed. The Florida Public Radio Emergency Network will provide updates to your local NPR radio station every hour throughout the event, and their team of meteorologists will occasionally be live on Facebook and Twitter with the latest.